As you all know if you follow me on my social channels, I am a travel addict and always on the road. So sometimes you have to relax and calm down at home. This is why I love the principle of Hammam. You have to take your time to follow the steps and through that you automatically slow down and concentrate on the ritual. The one I show you is in cooperation with Rituals. 1. Clean your skin with the Black Soap, which is nourishing and at the same moment deep pore cleansing. Take a Kessa Massage glove and rub it off your body. 2. Use the Hot Scrub to peel your skin and get refreshed by the scent of ginger. 3. With the Body Mud you cleanse your skin further in a very gentle way. 4. Soothe your skin with the foaming soap gel. It can also be used for a foaming massage. 5. 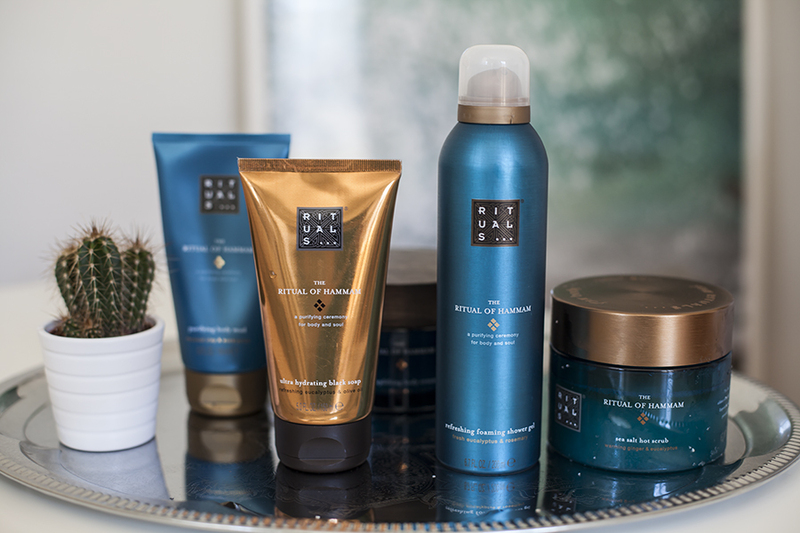 Give your skin the ultimate nourishment with the Body Cream. And then you can start daydreaming again of future trips. I always keep my mind close to my favorite destinations with having my surfboard in sight and surrounding myself with beautiful seaside pictures at home. Tolles Haus Spa, so toll.